There is hidden, and then there is really, really hidden, and as mentioned here before, a handful of spots that have been looked at are about as off the beaten path as they come. A few that come to mind include Louis in Quincy, Hoey's Pizza in Randolph, Bricco Panetteria in Boston's North End, Dudley Chateau in Wayland, and Ritu Ki Rasoi in Burlington. Well, it is time to add another to the list, and this one--a neighborhood bakery called B.C. Baking Co.--is about as far from downtown Boston as you can get while still being in the city (nearly 10 miles by car), and it sure does feel out of the way, so much so that even those who live not all that far away have never even heard of the place even though it has been around for a long time. While the address for B.C. Baking Co. is considered Hyde Park, the bakery is actually in Readville, a quiet little section of Hyde Park, which, as stated before, is about as far from Boston proper as you can get and still be in Boston. Readville itself is pretty hidden, and the neighborhood in which the bakery is located is away from the commercial center in a residential area mostly cut off from the rest of Readville--and Boston--by the commuter rail tracks to the east, an industrial area to the south, and some parkland (including Mother Brook, which is an historic canal) to the north. B.C. Baking Co. sits across from The Blue Hills Catholic Collaborative along a quiet side street, with the weathered old exterior looking more like something you might see in the middle of the countryside, while the interior is small but inviting with display cases full of pastries, a section in the back where various breads can be found, a tiny deli area also in the back, and a tray of pizza set up in the front by the checkout area. The clientele here is purely local and it is not unusual to see neighborhood folks hanging around the place, chatting with the staff or customers who come in. Being that this is basically an Italian bakery, you would expect all kinds of terrific baked goods and pastries to be found at B.C. Baking Co., and the place does not disappoint. Some of the items found here include warm scali bread (and if you have never had scali bread this fresh, you're in for a treat), French baguettes, freshly-made cannoli, delectable amaretto cookies, whoopie pies that are overstuffed with cream, apple pie, cupcakes, pizzelle, and chocolate cake. Cold cuts are available as well in the deli area, and meatballs and calzones are offered, too--and the big draw for many is the pizza, which is actually one of the main focuses of this review since it is so good. In a way, the "litmus test" for Sicilian pizza and bakery pizza is Galleria Umberto in the North End of Boston, and while many places in the region have excellent versions of this type of pizza, very few seem to serve the greasy, cheese and sauce-heavy version that Umberto's does, but the Sicilian slices at B.C. Baking Co. come very close. Interestingly, the bakery also sells "round" pizzas that are sealed in plastic wrap and look a bit like bar pizza, but they taste closer to Sicilian pizza which is unusual because almost all Sicilian pizza in the local area is served as square or rectangular slices. Prices for the pizza, pastries, breads, and other products here are extremely cheap, as might be expected from a local spot such as this. If you ever wanted a perfect example of a hidden gem, B.C. Baking Co. might just be it. It is one of those places where you could live your entire life in Boston and never even know it is there, and it almost feels like this is just fine with those who do know about the spot, as it has remained a well-kept secret for several decades now. If you want to check this wonderful place out, it's best to turn on a good navigation app, expect to turn around in a driveway or two, and try to avoid thinking you're lost and then give up as you head deep into this neighborhood of little one-family houses. By the way, if you rely on public transportation, it's actually pretty easy to get to B.C. 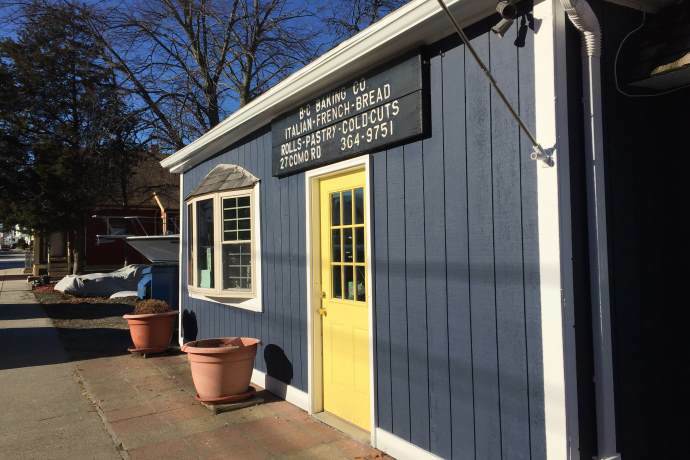 Baking Co., considering that the Readville commuter rail stop is within walking distance. However you get there, you'll probably be happy you did, and once you know where it is, it's really not all that difficult to find. Copyright © 2018, Boston's Hidden Restaurants (www.hiddenboston.com).